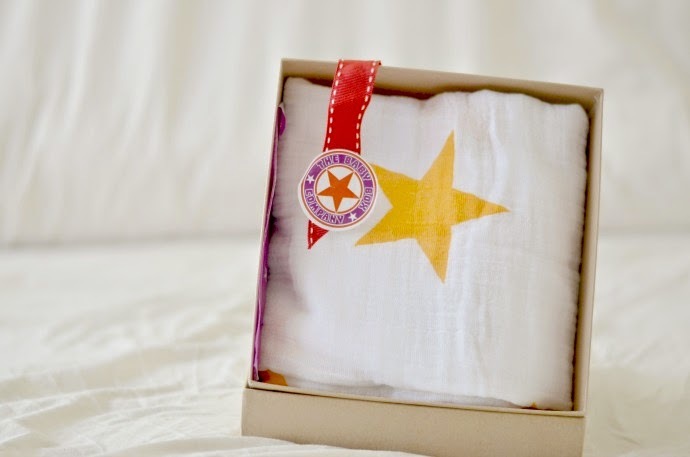 The Baby Box Company make lovely gift boxes for new babies and we were lucky enough to be sent one to review. I chose the 'really useful' medium box as I loved the contents and it arrived beautifully packaged. Unfortunately, I left the box, thinking I would photograph it in the morning when the light was better and two small boys found it first, so you don't get to see it looking lovingly wrapped but I can show you what is inside. There are so many things on the 'must buy' lists for babies that I have never used, but I do think that everything in this box is going to be helpful with our little one. The Aden and Anais swaddle is neutral and thin, perfect for swaddling, or just for using as a thin summer blanket orsomewhere to lie baby. I wanted to try one this time and the white and yellow will look perfect in our little Pretzel's nursery. 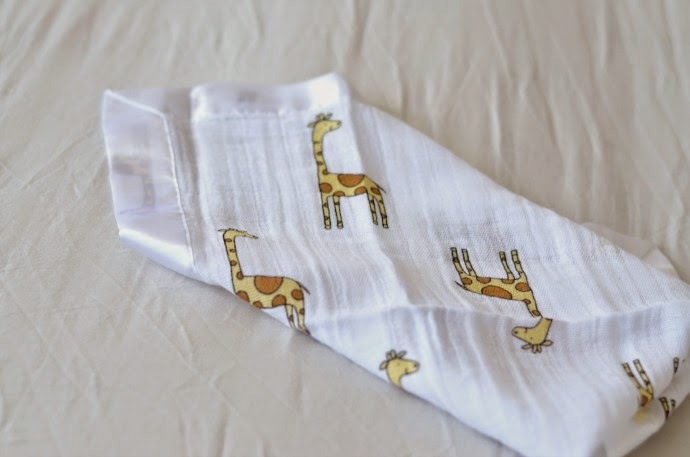 I never had sock ons with my other two, and I spent a lot of money on socks so I have already bought one pair of these in preperation. Archie still loves to take his socks off and I know these will be very helpful to keep Pretzel's feet warm in the sling. Whilst this baby isn't going to go short of toys, he isn't going to have many of his very own so it is lovely that he already has something new. 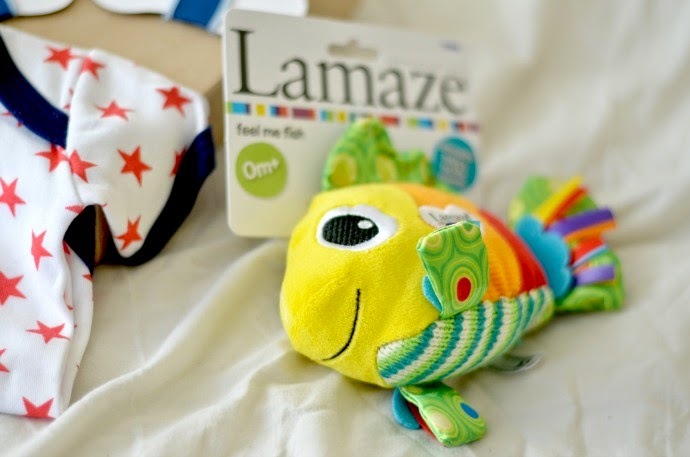 We are huge fans of Lamaze but don't have this one and it is being kept out of the other boys' way until our little one is ready to play with it. You can't go wrong with a babygrow and I love the bright colours and unisex design on this one. 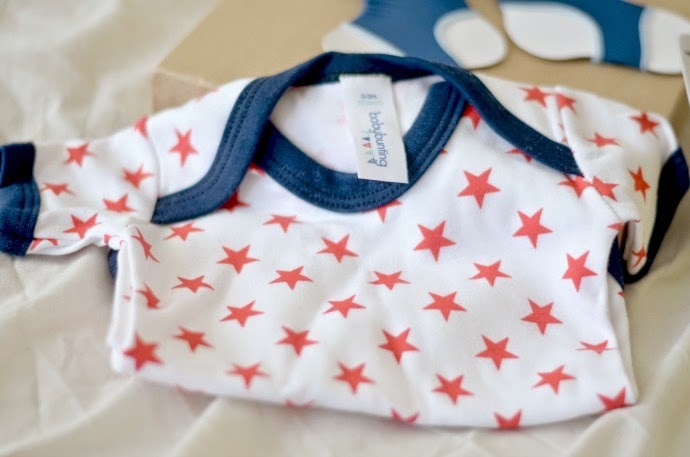 They come as standard in 0-3 month sizing, so you don't have to worry if you are buying for someone with a bigger baby and as it is short sleeved, it doesn't make a difference what time of year the little one is born. I remember all too well how frequently we changed vests to having another is indeed 'really useful'. The box comes with a small leaflet that gives you ideas on reusing the box as a baby sensory box - something I loved doing with the other two, and as the box is very sturdy, it will be perfect to store things in. The Baby Box Company do different themed boxes to cater for different price ranges and you can even make your own. I sneakily threw in a comforter blanket that I fell in love with at the last minute. We are really impressed with the contents and quality of the box - all the items are from companies we already love and it comes nicely presented. I think it makes a great baby shower or new baby gift - just don't leave it somewhere toddlers can reach it! I love the idea of these boxes, especially handy for non baby types who don't know what to get someone/their baby as an arrival present! I love the bits you got in your box too, especially the swaddle blanket!